British Reaper drones continued to operate over Iraq and Syria throughout the year as part of US-led Coalition to defeat ISIS. However we are not allowed to know exactly how many of Britain’s fleet are deployed there, or indeed, if any have been deployed elsewhere. In spring 2016 there was a noticeable decline in Reaper missions in Iraq and Syria which could indicate that some of the drones had been deployed elsewhere (perhaps for operations over Libya for example) although this remains speculation without further information. 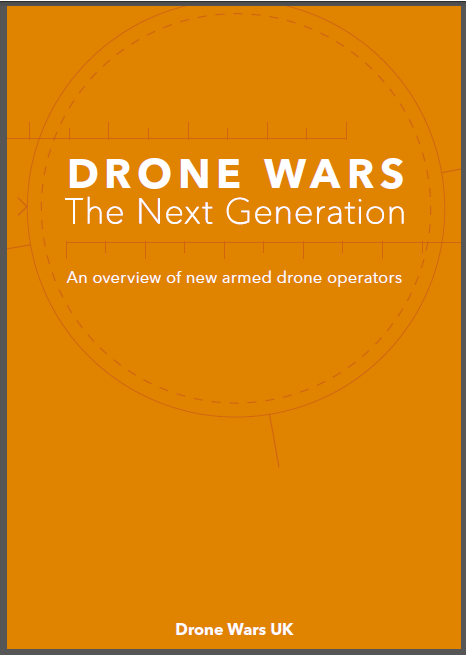 Figures released during the year showed that the UK is using its armed drones to launch strikes much more than the US. Around 17% of US strikes against ISIS have been carried out by drones, while over the same period of time 28% of British strikes have been from British drones. Despite the UK insisting its armed drones are used primarily for intelligence and surveillance, the percentage of armed drone sorties in Iraq which launch strikes (24%) is exactly the same for the UK’s dedicated strike aircraft (see table). In June the MoD revealed that 95% of UK strikes against ISIS had been launched under dynamic targeting procedures rather than being pre-planned. Pre-planned strikes are much less likely to cause civilian casualties than dynamic strikes, which can take place just minutes after a ‘target of opportunity’ is spotted. The MoD continues to insist that no UK strikes – now numbering around 1,200 – have caused any civilian deaths or even injuries. Many seriously questioned these claims during the year, with Airwars, the independent group which monitors civilian causalities from Coalition airstrikes, calling on the MoD to commission an independent review of the validity of its civilian casualty assessments. In September a British Reaper joined US, Australian and Danish aircraft in an attack which killed up to 62 Syrian soldiers mistaking them for IS fighters. Soon after the attack “RAF Sources” told the Daily Mail that the Syrian government’s claim that its soldiers were killed was ‘a lie as part of a propaganda war’. However the partial release of a US investigation into the attack in November confirmed an unknown number of Syrian soldiers had in fact been killed in the strike. The MoD responded by saying the attack “was reasonable, supported by the weight of information available at the time, and made in good faith”. No apology seems to have been contemplated. In December 2015, Parliament voted to extend UK air strikes against ISIS into Syria. Despite Michael Fallon insisting that it was “morally indefensible” not to bomb ISIS in Syria, the vast majority of UK air strikes in 2016 continued to take place in Iraq. 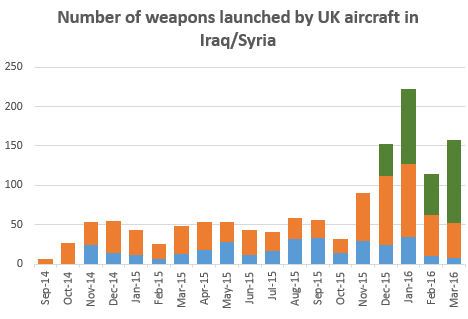 Latest official figures (up to Sept 2016) show that since the vote authorising the use of force in Syria in December 2015, 177 weapons out of 1,445 launched by British forces against ISIS have been launched in Syria (12%). Private Eye noted that there seemed to be a remarkable synchronicity between when UK Ministers faced the spotlight to answer questions on the war against ISIS in Syria, and when Syrian strikes occurred. Even the Defence Select Committee, not noted for challenging the MoD during on-going operations, called for greater information about UK strikes in Syria. The fallout from the August 2015 British drone targeted killing of Reyaad Khan in Syria continued throughout 2016. In January David Cameron was visibly annoyed after being questioned about the strike by MPs at the Liaison Committee. After the meeting Andrew Tyrie, Chair of the Liason Committee, told the Guardian that without further information the Intellegence and Security Committee, whihc continues to investigate the strike, “would not be able to do a thorough job.” Subsequently some sort of deal was apparently struck but it remains to be seen what exactly the Committee will be allowed to see and what it will be allowed to publish. In December the ISC stated on its website that its report had been handed over to the PM and was going through a “redaction process” with the expectation that a version of the report would be published in the New Year. In August 2016 a new international process aimed at controlling the export and use of armed drones was initiated by the US State Department. While a number of countries – including the UK – have signed the initial agreement, a negotiating process is due to begin in Spring 2017 (although it is far from clear at this stage what position the Trump administration will take ). 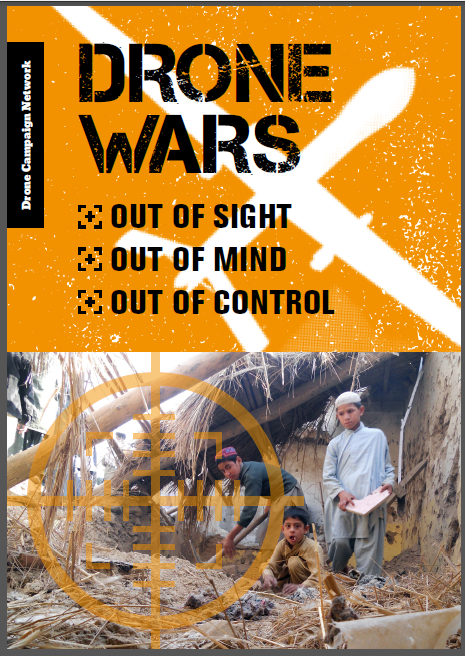 Ahead of these negotiations, analysts as well as MPs have called on the British government to publicly clarify its position on the use of armed drones outside of the conventional battlefield. Ahead of the Conservative Party Conference in autumn 2015, David Cameron announced that he was doubling the UK drone fleet again and replacing Reapers with the new “Protector” drone. .Despite the attempted re-branding, the MoD confirmed that the new drone will in fact be an updated version of the Predator B (Reaper) drone and a £415 million contract was placed with General Atomics in April 2016. In November the US approved the sale – of up to 26 aircraft – as well as Ground Control Stations and associated equipment. A key difference between these new drones – which are due to enter service in 2020 – and those in current service is that they will be able to fly within European airspace. In October the RAF confirmed to The Times that the MoD will seek permission to fly the new drones over the UK for training purposes, but that they would also be available to help civil authorities in emergencies. BAE Systems told reporters in June that they were in discussions with the UK government about a possible further series of test flights for the Taranis drone. Work on Taranis feeds into, but is separate from, the continuing development of a future Anglo-French drone currently dubbed Future Combat Air System (FCAS). In March the two countries committed further funding to the £1.54 billion project which is expected to go into development in 2017. Meanwhile BAE Systems are pushing ahead with developing autonomous weapons delivery from armed drones despite the international push to ban lethal autonomous weapons. In February the company revealed that it had tested Taranis locating a target autonomously using its sensors, and then simulating the target being engaged autonomously. According to a Times report, BAE Systems engineers say the future joint Anglo-French drone project is being developed with the capacity to strike autonomously as, though current rules do not permit such strikes, such rules may change in the future. *Correction made – Andrew Tyrie is Chair of Liason Committee not Intellegence and Security Committee. Thanks Chris, a comprehensive summary that gives us much to be concerned about. How long will it be before we allow autonomous strikes because the technology is available – money will speak loudest in the end.